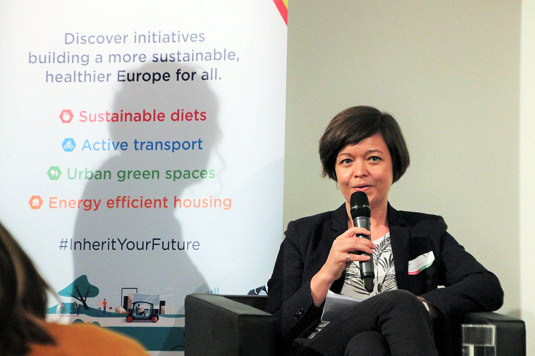 From vegetable gardens in schools to apps that motivate people to cycle to work – the Future Forum brought together promising practices for sustainable, healthy and equitable lifestyles from all over Europe. The CSCP’s INHERIT project organised the Future Forum with the aim to show how we can stay healthy, while keeping our environment healthy as well. The forum provided room for over 15 promising practices from all over Europe to showcase inspiring examples of initiatives that can enable and encourage people to live and behave in ways that improve the environment and their health. Among these practices was the Vegetable Academy (GemüseAckerdemie), with whom the CSCP collaborates as part of INHERIT. Antonia Mehnert, Regional Manager for The Vegetable Academy, presented the program for schools to engage and teach children to grow vegetables, in order to re-establish their connection with nature and help them gain knowledge about food origin and global food market issues. The initiative received a lot of interest about applying the programme to other parts of Europe. The forum also gave room for discussion on how these different initiatives can be strengthened to contribute to the ‘triple-win’, the opportunities and barriers to ‘mainstreaming’ good ideas and how barriers can be overcome to pave the way to more sustainable lifestyles and behaviours. GemüseAckerdemie showed how their programme sparks kids’ interest in organically grown and healthy food and how the initiative was able to expand to 250 learning locations in only five years. The discussion quickly moved towards policy changes that would be needed in order to ensure that every school has a vegetable garden and gardening becomes part of the curriculum. A second initiative, Questionmark, provides an app that gives consumers information on the sustainability and health impacts of a product on the go. They not only inform consumers, but also initiate change in producers’ attitudes. Founded and operational in the Netherlands, Questionmark responded to particiants’ interest in expanding the app to other countries. During the forum, CSCP project manager Rosa Strube also presented the CSCP’s work in the project: the four future scenarios, which showed what healthier, more equitable and sustainable European societies might look like in 2040 and the feedback from citizens on those visions. Some video impressions of the day can be found here. For further questions, please contact Rosa Strube.